THIS FRAME IS ON BACKORDER until approximately 5/27. Orders will be placed on hold until we get more inventory. Apologies for this delay. Each corner was chipped beyond repair, filler was not enough. Hello Carmallo. Thank you for your feedback. We apologize that your frame was chipped. This is an issue we would have liked to have taken up with our shipping company. If at anytime you are not completely satisfied with the order, you may return the order for a refund. We are always willing to make things right with you. Thank you for your feedback. I love this frame! I was skeptical because I've never ordered something custom made online and didn't know if it would be just like the pictures but I took a chance and couldn't be happier. It came well packaged and all I had to do was put the hardware on the back to hang it. It was easy and it's beautiful! Will definitely order from this company again. This is second frame I have purchased for my painting. He was a lot of work and needed the "perfect" frame. This is definitely it! Well constructed and aren't bed quickly. What more could one ask? 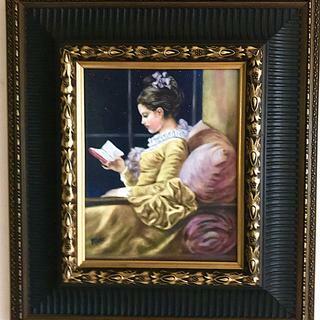 This is a canvas copy of my original painting beautifully framed using the RR10. The RR10 is a favorite for my art. Absolutely beautiful frame. Looked great online, but it looks even better in the real world. I love this frame. 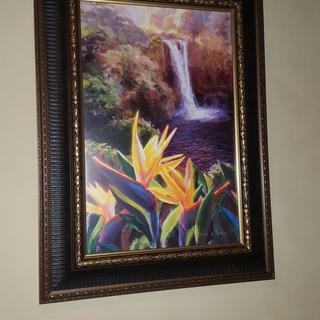 Because of the size of the painting I put it in, it was a bit pricey, but I think it was worth every penny! 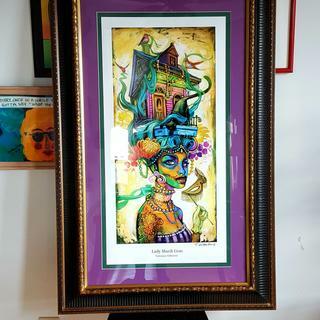 I'm in the business of selling my art, and the frame has to be good! 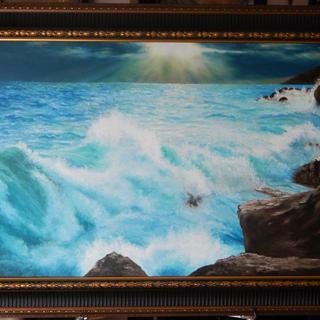 Stormy Waves On A Rocky Coast - Oil On Canvas - 24"x 40" - Framed in the RR10 frame! I am very pleased with the quality and craftsmanship of the frames. They were very well packed and the oil paintings easily went into the frames and were secured. I am very happy with my purchase. The frame is beautiful. It really shows off the canvas picture it is holding. I wasn't sure what to expect. This Frame was way more inexpensive than anything else I have looked at. I am thoroughly impressed. The frame is beautiful. It's actually better than I expected. I love this frame; it enhances a multitude of art works. It is a bit heavy, as are most of the Renaissance frames, but it is beautiful. I plan to use it again. Great all around product and value.. Loved the frame, the quality, the price and the value. Fast delivery and everything compelling to customer satisfaction. Recommend anyone interested in a great frame to take this path. Frame arrived quickly and was a perfect fit. Well made and a great value. I was more than satisfied with the frame when it arrived. It was very well built and substantial. Delivered on time and ordering on line was fast and easy. Photo reproduced on the canvas very nicely. I'm pleased with the quality of the mounting in the frame as well. Shipping doubled the cost, but it was securely packed and received quickly. Hello Sandra! Thank you for much for your review. We are so pleased to hear that your canvas looks great in the frame. That is awesome! We understand your concern regarding the shipping fees. Let us assure you that the shipping fees are not a profit center for us. We work with our Carrier to provide the most cost efficient shipping fees. Please consider the legendary packaging we provide which is also a factor in our Shipping fees. As you mentioned, we securely package the precious merchandise with the recommended packaging materials. Please sign up for our emailing list which will provide you with promotional offers ahead of time. This will help reduce the cost of the merchandise. You will also notice free shipping promotions offered periodically. If you need further assistance, please contact me directly. I can be reached at 1-800-332-8884. Thank you for your business! I bought this to frame a commissioned portrait. The color says dark hunter green, but to me, it looks black, which is what I wanted anyway. The gold touches add interest without overwhelming, and it's substantial looking. My clients were very happy with it, and I am too. I'll probably be ordering this frame again sometime, as it works beautifully with portraits. Packaging is always outstanding, as is customer service. Very nice quality frame at a good price! The spruce green is very subtle so you really don't notice that its green. Looks more black or very dark brown. Absolute perfection. My first frame arrived slightly damaged, they rushed the replacement in a couple days. I certainly recommend them and will order more! Hello Saxon. Thank you for placing your order. We regret that you are not pleased with the Spruce green accents in the frame. In the future, please take advantage of our free samples. We are more than happy to exchange the frame, or offer you a full refund. I will give you a call today to see how you would like to proceed. We look forward to making this right with you. Have a great day. 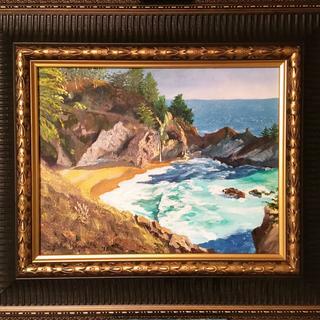 Beautiful frame, will greatly enhance my painting. 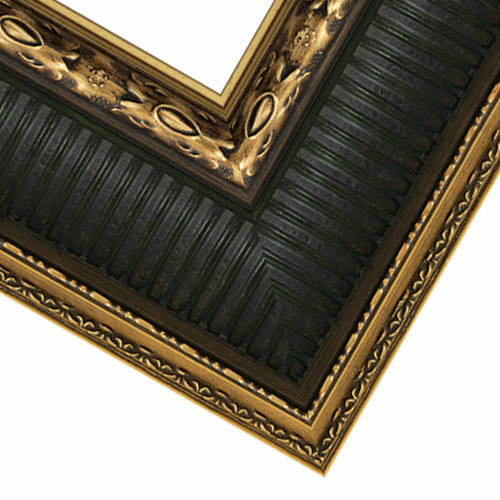 This frame looks elegant without being too fussy. Because it's has a good bit of ironic flair for my rather pedestrian print. My mom recently passed away. She had 6 of my paintings on her walls from over the years. One of which I am giving to my older brother. The frame it was in was old and not in good shape. It is a 24"x 48" sunset seascape. When I uploaded a photo of the painting in the frame shop and put this RR10 frame around it, I knew that it was the one! The colors match the painting beautifully. liked gold and dark green combo, my picture is of woods with greens and blacks. Substantial size / weight / Rich look vs price (Doesn't hurt my margins) NEED MORE LIKE THIS ONE! Framing a Whistler and this matched. 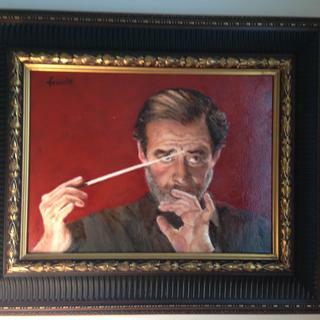 I have a similar painting with a older version of this frame, they look awesome together. This frame has some heft to it and is nicely detailed but not over powering. How green is the frame? BEST ANSWER: Hello! The green on the frame is very subtle. Please order a sample to see the frame before making a purchase. Thank you for your inquiry!